My Negroni shirt muslin is finished and I’m quite happy with it. I played around with the pockets and if I had enough fabric, would have tried to match the stripes better, the pocket on the right was just for fun. Once I got the plackets worked out, they were VERY simple! 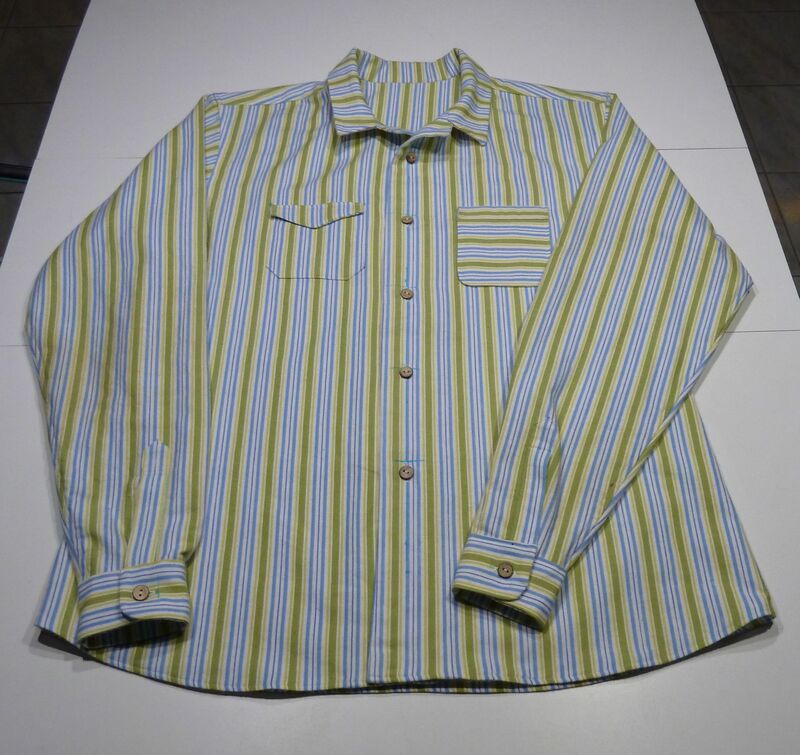 For my final shirt, I’m going to do a mash-up of the Negroni shirt and Kwik Sew 2777 , I’m going to use the collar and stand from Kwik Sew and everything else from Negroni. Thank you Gigi for creating a tutorial on fabric pattern matching, I’m going to start on my paisley shirt next weekend and am looking forward using all the tutorials found along the way. My only complaint is perfect stitching with my machine (Sapphire 850), when it comes to crossing seams, the stitches seems to get a little smaller going over the hump and I hate when that happens. If you have any hint or tips, please forward them along! 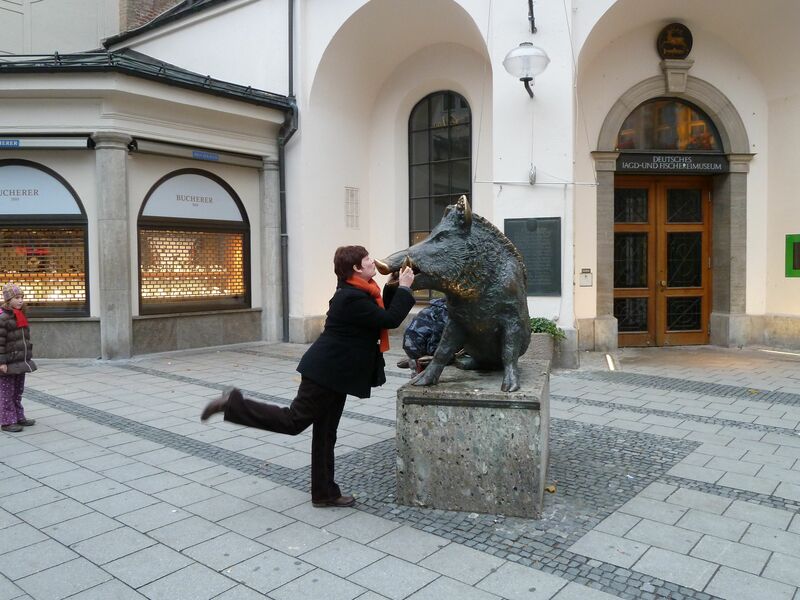 TDF took this photo of me kissing the (lucky) boar in Munich, Germany (Oct.2010). This entry was posted in Gigi Sews, Sapphire 850, Shirtmaking by Tabatha. Bookmark the permalink. What are you talking about? Your muslin looks great!! Awesome! I just started cutting my muslin today! Maybe i’ll get some of it sewn tomorrow. Thankfully, Peter’s going slow enough. @ Shirley, is your machine changing stitch lengths or skipping stitches. If I’m sewing along and suddenly one stitch it longer than all the others, it’s skipping stitches. This can be caused by thread, dulls needles or your machines “timing” being off. Has it been serviced regularly? @Jackie: my stitches get smaller when I go over a hump as the feed dogs try to navigate over the layers. This happened with my Baby Lock too, it’s not skipped stitches, quite the opposite! But I’m servicing is a good idea, mine’s overdue!